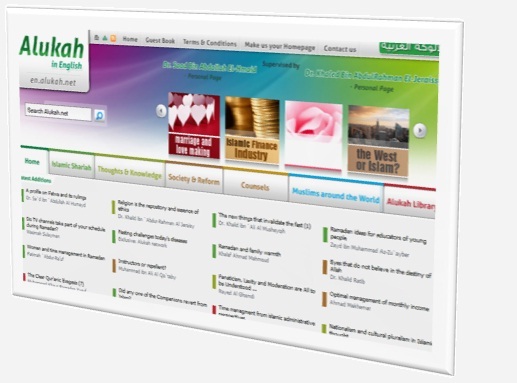 By the favor and bounty of Allah, Alukah network has achieved with its diverse websites a distinct and a prestigious position in scientific, cultural, and intellectual fields. Alukah has maintained a high level of professionalism and objectivity during its first launch and now it is following the same track to complete its mission to reach every concerned person and every seeker for the truth and for authentic information. It is oriented for a large class of people who do not speak Arabic, placing ahead the goal of conveying the authentic Islamic culture and balanced Islamic thought to: non-Muslims, newly converted Muslims, and non-Arabic speaking Muslims. We are keen to copy our excellence in Alukah Arabic Network to our English version, taking into account the cultural and intellectual differences. We ask Allah to help us achieve all good, grant us success in all materials that we publish for individuals and the Muslim community.